WASHINGTON — The communist Chinese government charged four people for their involvement in the deadly knife attacks at a railway station in the southwestern city of Kunming last March, where 29 people were killed and 140 were injured. Reuters reported that eight militants, Muslim men from the rebellious western region of Xinjiang, attacked unarmed civilians who were waiting for trains at a local train station. City policemen shot and killed four of the eight attackers. The Chinese government called it a terrorist attack and treated the arrested militants as such, blaming religious extremism among Xinjiang-area Muslims Uighurs. Uighurs are a minority in China and resent the Han Chinese government, who have repressed them, their religion and culture. 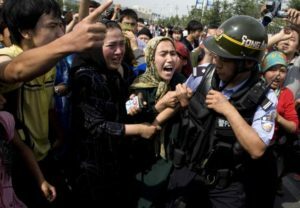 There have been several attacks on Chinese police and civilians recently, where the Chinese police killed eight Uighur attackers as well as the aforementioned train station attack. The four Muslim defendants, all with Uighur names, will most likely face the death penalty once their trials begin. The official news agency of the communist government said that the government prosecutors felt there was abundant evidence to convict and sentence the militants.